I’ve often heard pastors say that we never retire from serving God. And that’s true – we don’t read anything in God’s words that tells us we are ever too old to serve him, to fulfill the reason why we are here. The fact that we’re still alive proves he still has a purpose for us. 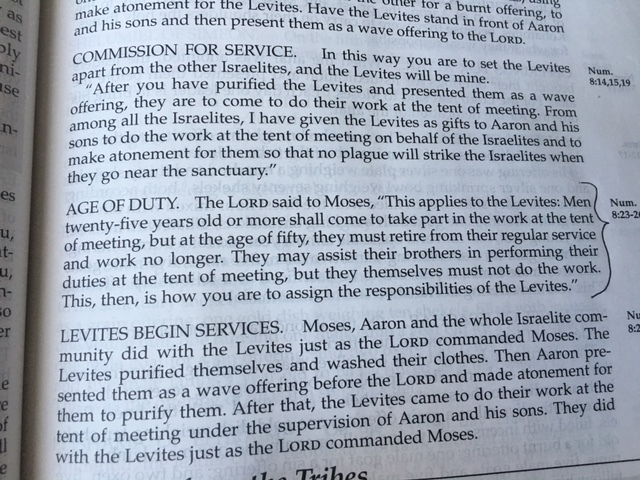 In Numbers 8, God tells Moses that the men must retire from their work in the Tent of Meeting at the age of 50. That was actually pretty young back when people lived a lot longer than today. After the men retire, they are to assist their younger brothers who are actually doing the work. The torch of leadership needs to be passed on to the next generation. And the older, wiser crowd still works by teaching, mentoring and encouraging those who are now leading. The responsibilities are passed on to the younger generation. Some churches really struggle with this. Because the older crowd doesn’t want to give up control. They want everything to be like it has been for the last 30 years. And the younger generation just isn’t going to do that. They are going to change things! So the older generation fails to hand over the baton and the younger generation leaves to go to another church or maybe stops going to church at all because there is no place open to them where they can use their strengths to serve God and grow their faith. This discussion of retiring in order to reach out a hand to others who are leading and learning resonates with me because this is what God has been doing in my life these last several years. He has changed my purpose within my church family to assisting my brothers and sisters in deepening their faith and growing in their spiritual leadership. But not to hold the torch myself. From my perspective, its easy to see that God’s plan in Numbers 8 works very well.